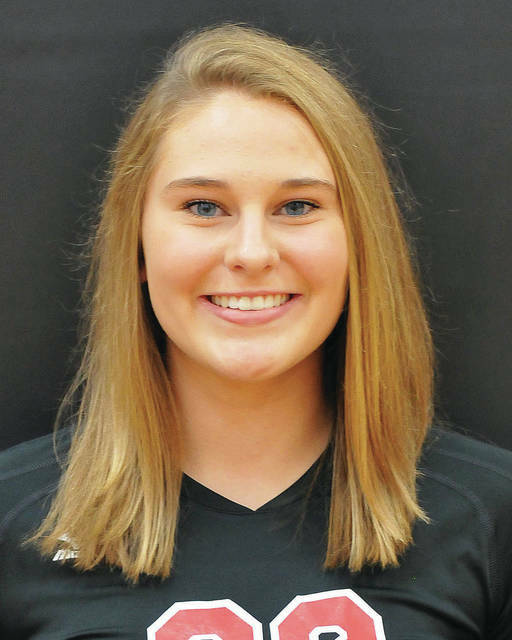 SIDNEY — After a close first game, Fort Loramie pulled away to beat Fairlawn in a Shelby County Athletic League match on Thursday. Fairlawn led early in the first game but the Redskins rallied late to earn a 25-22 win. Fort Loramie won the second 25-17 and third 25-8. Ava Sholtis led Fort Loramie with 11 kills, while Marissa Meiring had seven and Chloe Stang had five. Maya Maurer and Aleah Frilling each had 14 assists. Emily Austin had 14 digs while Meiring had 11. The Redskins improved to 3-2 with the win, while Fairlawn dropped to 1-1. The Tigers earned a hard-fought Shelby County Athletic League win over Russia on Thursday. Jackson Center won the first two sets 25-16 and 25-22, but Russia won the next two 25-17 and 25-22. The Tigers pulled away to a 15-11 win in the fifth set to claim the match. Raquel Kessler led the Tigers with 23 kills and had 15 digs, five aces and six blocks. Caroline Frieders had 24 assists, 12 kills, seven digs and two aces. Katelyn Sosby had 21 digs, Ashley Mullenhour had 15 assists and six digs, Megan Argabright had five kills and Deja Wells had four blocks. Laurissa Poling led Russia with 17 kills and had 13 digs and six blocks. Kendall Monnin had a team-high 17 digs and Ava Daniel had 15 digs and three aces. Ashely Scott had nine kills, nine digs and three aces. Jessica York had six kills and Sam Gaerke had five. The Rockets beat Botkins 25-6, 25-9, 25-4 in a road SCAL game on Thursday. Emma Meyer led Anna with 12 kills and three block assists while Sierra Williams had five kills and three aces. Lexi Wells had 26 assists and three aces. Abby Counts led Anna with 10 digs while Meyer had seven. Minster won a home nonconference match against Houston on Thursday 25-15, 25-17 and 25-16. Danielle Barhorst led Minster with 15 kills and 16 digs while Lilly Pelletier and Josie Winner each had nine kills. Emily Stubbs had 15 digs and Ava Sharp had 12 digs. Winner led the team with 22 assists, while Kaitlyn Wolf had 10. Hayden Riesenbeck led Houston with four kills while Alyssa Kemp, Allisen Foster, Catryn Mohler and Mariah Booher had two each. Kemp had 14 assists and three digs. Olivia Bowser led the team with 17 digs, while Hannah Bixler had seven and Kemp had six. The Cavaliers beat Waynesfield-Goshen 25-10, 25-17 and 25-3 in a road Northwest Central Conference match on Thursday. Lauren McFarland had nine kills while Olivia Lucia had five kills and four aces. Alexis Snipes had a team-high 17 assists. Resse Geise had five aces and Pyper Sharkins had four aces. Despite a strong effort by Sidney in the third set of a home Greater Western Ohio Conference American North Division match on Thursday, Troy scored three of the last four points to close out a 25-23 win. The Trojans won the first set 25-16 and second 25-14. Arielle Snider led the offense with 10 kills on 26-of-28 attacks. Alina Kindle and Darien McBride each knocked down three kills. Snider tallied four solo blocks and Kindle added two. Abby Nuss served 15-of-17 with an ace and Payton Boshears also added an ace. Boshears tallied nine digs on defense with Kindle, Nuss, and Faith Bockrath each scrapping for four. The Pirates lost a home Northwest Central Conference match on Thursday. The Pirates won the second set 25-23, but Hardin Northern won the first 25-16, the third 25-17 and the fourth 25-23. Shelby Giles had 10 kills and 12 digs. Lauryn Sanford had seven kills and 15 digs. The Rangers earned a 25-9, 25-23, 25-21 win in a home nonconference match on Thursday. Tasia Lauth led New Knoxville with 15 kills while Megan Jurosic had eight kills and three blocks. Carly Fledderjohann had a team-high 29 assists and Erin Scott had a team-high 23 digs. The Rockets earned a road Western Ohio Soccer League win on Thursday. Taylor Noll, Taylor Kauffmann and Megan Dieckmann each scored a goal for the Rockets. Kaufmann had an assist and Michaela Ambos had an assist. Savanna Hostetler had five saves in the shutout win. Hannah Giguere and Heidi Toner combined on the shutout in goal. The Cavaliers built a 6-0 halftime lead on their way to a WOSL win on Thursday. Grace Olding scored two goals while Olivia Monnin, Liz Gibson, Lindsey Magoteaux, Grace Monnin and Ava Behr scored one goal each. Magoteaux, Rylie McIver and Lyndsey Jones each had two assists while Behr had one. Nick Fischio led the Trojans with 39 in Thursday’s Shelby County Athletic League win at Shelby Oaks Golf Club. Alex Bajwa, Isaac Cisco and Jack Dietz each shot 48 for the Trojans. Kyle Peters led Fairlawn with 46. Jackson Jones shot a 48, Doug Wright had 40 and Skylar Piper had 51. The Redskins earned an SCAL win at Shelby Oaks on Thursday. Zach Pleiman and Mitchell Puthoff each shot 41 for the Redskins. Eli Rosengarten shot 42 and Devin Ratermann and Caleb Meyer each shot 47. Cole Pitchford led Houston with 44. Collin Walker had 47, Nathan Stangel had 47 and Jon Steiner had 48. Joseph Magoto led the Wildcats with a 36 in a Midwest Athletic Conference match at Mercer County Elks Golf Course on Thursday. Grant Voisard shot a 39 for Minster, while Logan Lazier had 44 and Ethan Lehmkuhl had 45. The Tigers lost a MAC match on Thursday at Mercer County Elks. Connor VanSkyock led Versailles with a 41. Alex Keiser shot 45, Will Eversole had 47 and Ethan Kremer had 49. The Rangers lost a MAC match by one stroke at Mercer County Elks. Ray Newton shot a 45 and Sam Anspach shot 47. The Redskins won a home nonconference match at Arrowhead Golf Course on Thursday. Eva Bolin led the Redskins with 42. Amy Eilerman shot 47, Riley Middendorf shot 53 and Rheese Voisard had 54. Dana Jones led Riverside with 50. Mia Stallard shot 56 and Kalin Kreglow and Mereana Steely shot 57. The Cavaliers struggled in a nonconference match against Centerville’s B squad on Thursday. Claire Larger lost 6-0, 6-2 at first singles. Shannon Staley lost by two 6-0 scores at second singles and Brieanna Werling lost by two 6-0 scores at third singles. Sarah Gibson and Angela Brunner lost 6-1, 6-0 at first doubles and Ann Pannapara and Keira Burns lost 6-2, 6-0 at second doubles. The Tigers earned a nonconference win at Stillwater Valley Golf Course. Alex Keiser and Ethan Kremer each shot 42 for the Tigers. Connor VanSkyock had 44 and Austin Pleiman had 45. Evan Coverstone led Russia with 45. Drew Sherman had 48, Max Bohman had 50 and Christian Stueve had 56.